Dec 20th, 2017: Showcase store manager Sharrel Lobo talks some of this year's hottest gift ideas on CTV Calgary. Dec 19th, 2017: Food Blogger Shel Zolkewich Talks Gotham Knives On CTV Winnipeg Morning Live. Aug 24th, 2017: Gotham Steel partners with the 2017 World Food Championships. The Gotham Steel Pan is the newest in non-stick cookware made with ceramic and titanium. 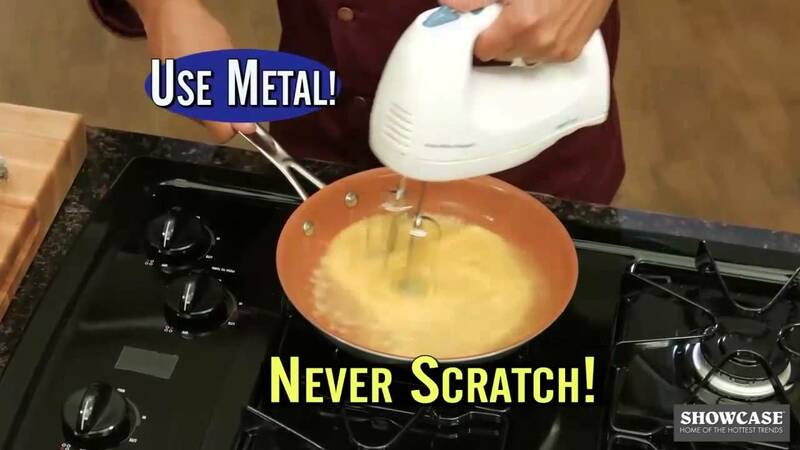 This non - scratch technology allows the Gotham Steel Pan to be safely used with even metal utensils. The best part is that with the non-stick ceramic, everything slides off so no unhealthy butter or oils are needed while cooking. Completely free of PTFE/PFOA/PFOS chemicals, the Gotham Steel is also oven safe for up to 500 degrees. It is also dishwasher safe and clean up is a breeze. Cook your favorite meals and snacks, from fried eggs, to melted cheese, s'mores and more, with the Gotham Steel even troublesome foods slide right off! No more scraping and scratching, Gotham Steel makes cooking fun and enjoyable again. Download the recipe book HERE. I ordered two frying pans; one of them has a rounded bottom and does not sit level on the stove or other surface; the other is perfect; cooking in them has been highly successful . I love gotham! This pan is amazing. I do all the cooking in the house and I will never use another pan that isn't gotham. I make my breakfast in this pan every morning and my eggs turn out perfect!! This is one of the best frying pans I've ever used. Versitile, and very easy to clean. I definite recommendation. I use this product everyday, doesnt stick , eggs slide right off!